Blog>What Size Furnace Do I Need? Getting the right size furnace is important to keep the air comfortable at home and to optimize your financial investment. Too small a furnace will not heat the house properly and will wear out sooner, and too big a furnace will waste energy and money on a daily basis. To help you answer the question “What size furnace do I need?" we’ll show you a basic formula for figuring out what size BTU furnace will efficiently heat your house. What Size BTU Furnace Do I Need? BTU means British Thermal Unit, a standard unit of measurement for heat energy. You can read more about how energy is measured in this post. The standard formula for figuring out the number of BTUs your new gas furnace must produce to heat your home is as follows. You might already know the square footage of your house. If not, it’s fairly simple. Just multiply the length times the width of each room and add them together. Let’s say for this example that you have a 1500 square-foot house. 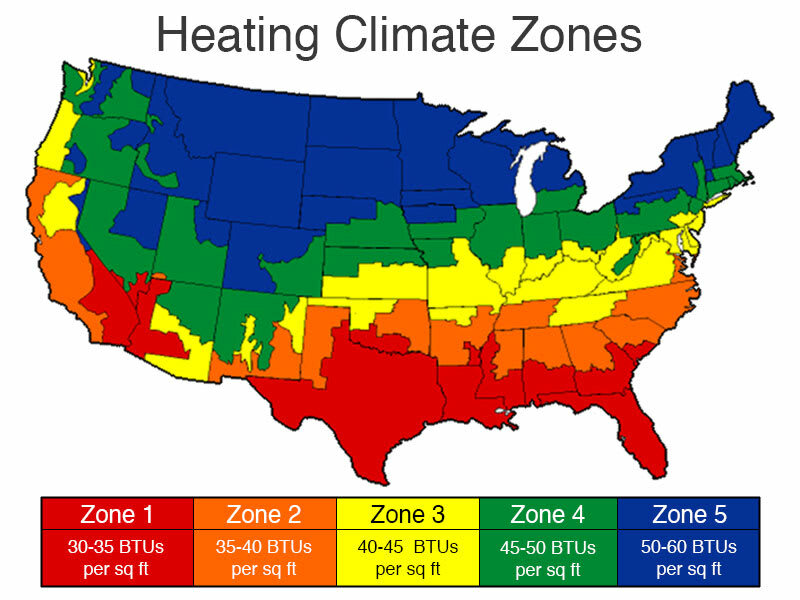 The next element of the equation is the heating factor for your climate zone. Thankfully, this part is also pretty easy and requires no math on your part. Heating and air conditioning companies have the U.S. broken down into 5 climate zones based on average air temperatures and weather conditions. You can easily look at the zones and figure out what number your hometown air falls into. Find the zone your home is in and choose either the higher or the lower heating number based on a couple of variables. If you have a newer home with quality insulation, choose the lower number for your zone. If your home is older and the insulation could use updating, choose the higher heating number for your zone. For our example, let’s say you live in a newer house with good insulation in a Zone 3 section of Kansas. Here’s your formula in action. So, the size of furnace you’ll need must have a 60,000 BTU output. What about if you’re looking at a furnace, but you only see the BTU input rating? How do you find the actual output to see if it will work in your home? For this, you’ll need to multiply the BTU input by the efficiency of the unit to get the actual output. Use this formula to figure out what a furnace would produce. Let’s say you find a furnace you like that lists 90,000 BTU input and an efficiency rating of 85 percent. Here’s the formula with those numbers plugged in. Efficiency is a very important factor in finding the right heater for your home. The same 90,000 BTU gas furnace with 95 percent efficiency would offer 85,500 BTU to heat the air in your house. Though the guidelines above are good general rules of thumb, there are factors other than square footage and location that can play a role in your furnace size. The air in your house and the ductwork are affected by things such as whether it’s a one- or two-story home. A second story adds a layer of insulation for the first floor. Here are a few more considerations. Much of this applies to air conditioning systems as well as furnaces, as they both deal with heating the air and ductwork. Even if you have a good estimate based on your own calculations, it’s always a good idea to call a contractor out to run the factors through a software program that can double check the numbers. The closer you are to being exact, the better your furnace will serve you.